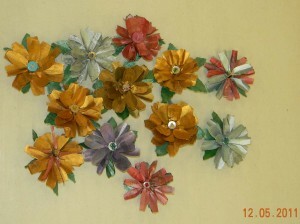 We had a bl ast making these Newspaper flowers with members Barbara and Julie! These easy to make pins came out beautifully, as you can see! Our workshop leaders provided painted and prepped petal materials (yes, from newspaper), bases and buttons and all we had to do was cut and glue our beautiful pins together! We had loads of laughs, a great fashion show and we even got home early! A good time was had by all! Thanks to Julie and Barbara! This entry was posted in Workshops by hann8666. Bookmark the permalink.